Based in rural Willamette Valley, Oregon, Alexandria Huff takes dramatic portraits with a painterly aesthetic. Her clients are men, women, and children (and dogs on occasion) who are photographed either alone or in groups of two. She shoots in a painterly, chiaroscuro (Italian for "light-dark") style that is moodier and edgier than other head shots. Expressions and posing are in a traditional, somber style – a nod to timeless portraits of the past. An Alexandria Huff chiaroscuro is more than a portrait, it is an heirloom. Alex shoots with professional equipment and lighting and provides a lot of model direction to ease any tension you may have about being photographed, how to look, and your positioning. Editing is provided so that you may look your best while still looking like yourself. Scarves and other decorative elements can be provided. Shooting can be done on location or at Alex's humble country studio space. For training, teaching, and experience, Alex's photography and lighting tutorials can be found on 500px and her blog. She is a Marketing Coordinator for BorrowLenses.com and also writes for SmugMug. 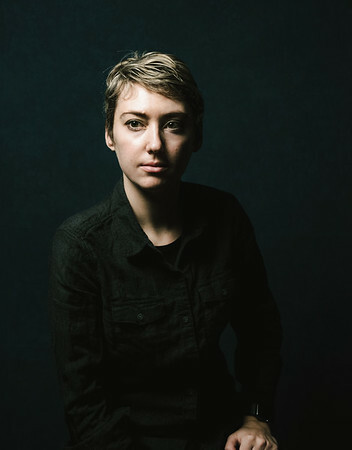 She learned about lighting and teaching while modeling for photographers such as Joe McNally and has since gone on to teach lighting workshops of her own in San Francisco. In a past life, she shot motorsports for X-Games, World Rally Cross, and Formula Drift.